The music of the Eagles is timeless and has influenced many artists over the past 45 years. The band have always encapsulated pop, rock, country and a style all of their own layered with superb harmonies and blistering musicianship. 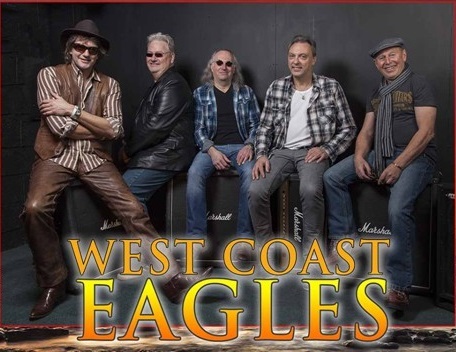 To contemplate a tribute show to a band of this calibre and with such a legacy of songs is a daunting task indeed, yet this is exactly what ‘West Coast Eagles’ have done. Each member of the band has been working in the music industry for over 30 years with many top name cabaret, show band and tribute acts. Their love of the Eagles music and their own accomplished careers in music has brought this band together in one package. West Coast Eagles. So sit back, ‘take it easy’ feel the warmth of a ‘Tequila Sunrise’ and the cool wind in your hair.